As with anything I post regarding virtualization – nothing groundbreaking, just some notes. To manage storage multipathing, ESX/ESXi uses a special VMkernel layer, Pluggable Storage Architecture (PSA). The PSA is an open modular framework that coordinates the simultaneous operation of multiple multipathing plugins (MPPs).PSA is a collection of VMkernel APIs that allow third party hardware vendors to insert code directly into the ESX storage I/O path. This allows 3rd party software developers to design their own load balancing techniques and failover mechanisms for particular storage array. The PSA coordinates the operation of the NMP and any additional 3rd party MPP. 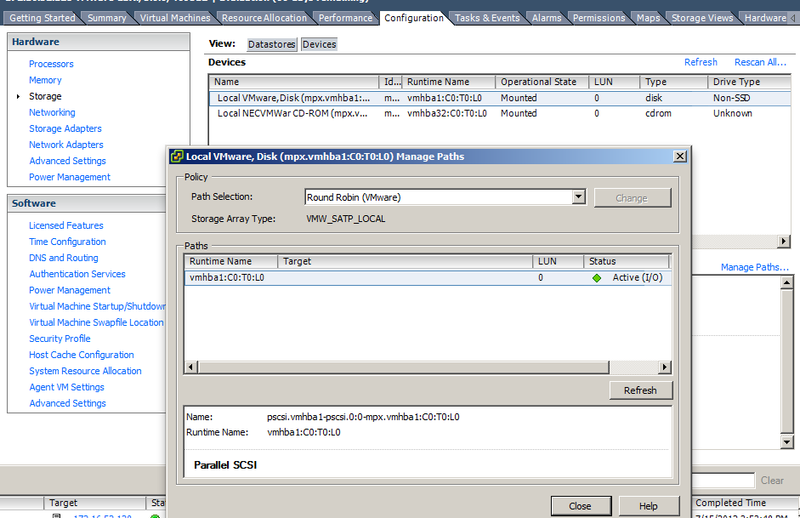 The VMkernel multipathing plugin that ESX/ESXi provides, by default, is the VMware Native Multipathing Plugin (NMP). The NMP is an extensible module that manages subplugins. There are two types of NMP subplugins: Storage Array Type Plugins (SATPs), and Path Selection Plugins (PSPs). 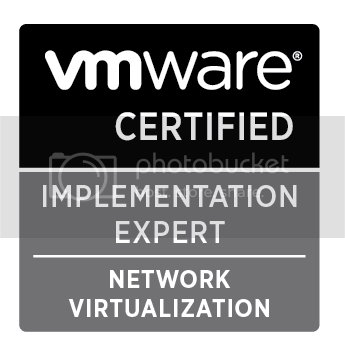 SATPs and PSPs can be built-in and provided by VMware, or can be provided by a third party.If more multipathing functionality is required, a third party can also provide an MPP to run in addition to, or as a replacement for, the default NMP. VMware provides a generic Multipathing Plugin (MPP) called Native Multipathing Plugin (NMP). What’s new in 5.0 (regarding multipathing)? Host Profiles have been extended to include support for storage multipathing. You can view the Storage Array Type and set the NMP pathing policy in Host and Clusters > Configuration tab > Storage (Hardware pane) > Click the Manage Paths link in the Device details section. Most Recently Used (MRU) — Selects the first working path, discovered at system boot time. If this path becomes unavailable, the ESX/ESXi host switches to an alternative path and continues to use the new path while it is available. This is the default policy for Logical Unit Numbers (LUNs) presented from an Active/Passive array. ESX/ESXi does not return to the previous path when if, or when, it returns; it remains on the working path until it, for any reason, fails.Note: The preferred flag, while sometimes visible, is not applicable to the MRU pathing policy and can be disregarded. ~ # esxcli storage nmp [ENTER] will display the following namespaces, and allows for many useful native multipathing operations. Useful for confirming GUI configurations. Output from ~ # esxcli storage nmp device list command. I know that’s not much but it’s all I got 🙂 . Sayonara.